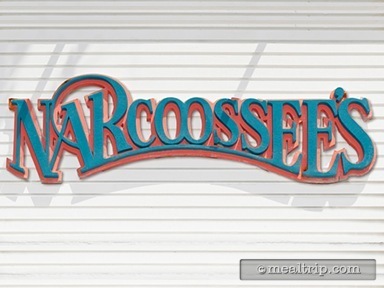 Narcoossee’s has offered a “brunch” dining period every now and again, (as of this writing... occurring on Sunday’s from 10:00am until 2:00pm). The waterside (and water-level) location is a great way to casually gaze across the Seven Seas Lagoon. Brunch includes an “adult” specialty cocktail, a pastry basket, one appetizer (from a few selections), one brunch entree, and a trio of mini-desserts. The entree menu is slightly less “costal” than the dining menu offering “Club House American Cuisine”. Please click our “see their menu” link to view a current list of offerings.